Finally, your little man can look as stylish as the big man in your life. We were bowled over by babysusu’s functional mix of classic styles and understated modern detailing, not your usual T-shirts with cutesy animals, space ships and fire engines. With pieces made from all natural fabrics like cotton, cashmere and wool, babysusu’s collections are designed to suit your boy from playdates to your best friend’s wedding. 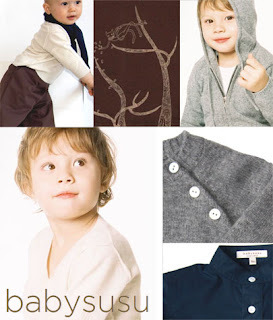 If you are planning to bring your little man to one of those cold countries during the Nov/Dec school break, do pack along one or two pieces of babysusu’s 100% cashmere sweaters HERE, they’re offering our readers a cool 25% discount. 25% discount on babysusu’s Fall 2008. Please qoute ‘susu25’ when checking out. Discount is not applicable on cost of international shipping.